Are you ready to strap a Visor to your bike? VeloTrend BikeBrain transforms your Visor into an advanced bicycle computer which incorporates graphical displays, route directions, dynamic logging and smart features such as automatic wheel size calibration. 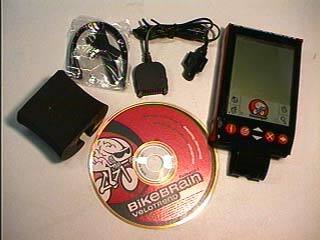 The kit, which costs $99.95, includes BikeBrain for PalmOS BikeBrain Desktop for both Windows & Mac, wheel sensor kit (hooks up to the serial port), case, mounting grip and a strap. The system works with all Visor models, however Prism owners will have difficulity reading the screen in sunlight.